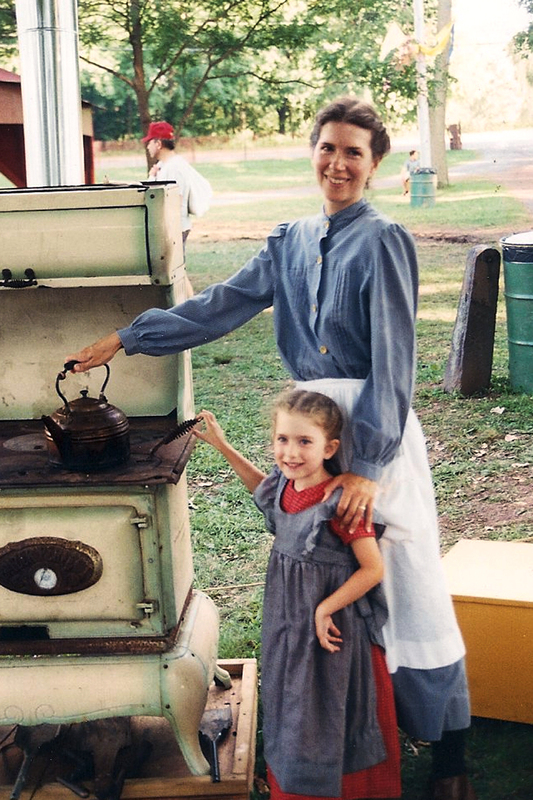 Tips for Bringing Children to Historic Sites ~ The History Girl! New Jersey may be young compared to places like England and France, but there is still a rich history here that is worth sharing with your children and visiting them should be fun as well as educational! 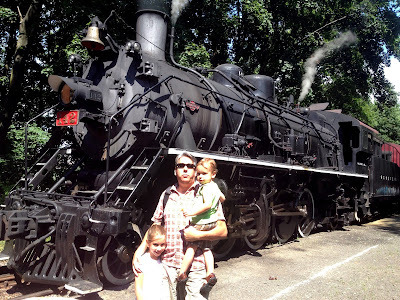 Delaware River Railroad Excursions, Phillipsburg, NJ. I've been taking my daughter to old houses, reenactments and history festivals since before she could walk - and she's now seven. I'll admit that my success with her has been partly luck, but it's also been the result of thoughtful planning. Now with a two-and-a-half year old toddler as well, I think some of my experiences can help you and your children learn about the Garden State's rich history with more fun and less fuss. Start with local places. Most children won't want to take a house tour after an hour or more in the car. Every county has historic homes and structures, so finding a place close to home shouldn't be a problem. As your child learns what to expect (and what is expected of him or her) you can branch out to further locations, especially if your son or daughter has a specific interest. Cater to your child's personality. Just as child-friendly vacations should be centered around the children, so should trips to historic sites. If your child is energetic and can't sit still for more than five minutes, you're just asking for trouble if you sign up for an hour-long guided tour or even worse, a lecture. Choose places that offer self-guided tours so you can move at his or her own pace - even if that means taking a break or two - or scenic areas like Washington's Crossing State Park, where your child can roam freely while you point out the sights. If your child is older, have them help you pick a place. Visit a location when there is a special event. Sadly some places, even historically significant, may just look like an old building to a child - and even for some adults. You can avoid that pitfall by attending an event that could have costumed volunteers, colonial music playing, or food from a particular period. There are several wonderful annual events throughout the state that promote historic locations and events. Somerset County's Journey Through the Past weekend in October is one great opportunity to expose the whole family to several sites including some that aren't usually open to the public. Or you can combine spooks and the past with a trip to Cape May for their Halloween Happenings in October. Try to get your child excited before the trip. Many places have websites where you can see photos and give an overview of where they'll be going. Show him or her pictures or tell a story about the place. If it's an older child and it's a place like Rockingham in Kingston, New Jersey with a connection to George Washington and the Revolutionary War, emphasize the site's historic significance in a fun way. Appeal to your child's interests. If your son likes superheroes and soldiers, take him to a battlefield reenactment, such as the Battle of Bound Brook held each year. My daughter is a princess all the way, so I often relate historic mansions like Ringwood Manor in Ringwood, New Jersey to a fairytale castle or point out fancy historical dresses or unique architecture and she is much more engaged during a tour. Try to relate historical facts to your child's life and perspective. My daughter loved the idea of a butter churn while visiting the Miller-Cory House in Westfield, New Jersey - until she learned it would take hours to churn butter. Try to plan for success. If your child is a morning person, schedule an early trip. Go out after your child has a nap. Make sure they have a good meal before you leave but bring snacks and drinks along right before you start your tour or to bring with you (if it's allowed). And change diapers or take a potty break first. Have a plan B. No matter how much you've prepared or talked things up, things happen. Your child could get bored or be cranky even if they've had a nap. What will you do? If it's a scheduled house tour and your child is really unhappy or making a scene, be prepared to leave temporarily or permanently so you don't torment your child or ruin other visitor's experiences. My two-and-a-half year old made it thirty minutes into a forty minute house tour before he got antsy and my husband hung back with him in another room while the tour continued. After a few minutes, they rejoined me and my daughter and the rest of the group and did fine. But if he hadn't recovered, my husband was ready to leave the house and wait outside so he wouldn't disturb the other visitors. Take lots of photos (where allowed) and ask your child questions about what they think and what they liked about their visit. If you have an older child, let them take photos; it will keep them occupied and give them something to look at later. Asking questions will help them remember some of what they learned and also give you feedback on where to visit next time. The photos will help remind them of their trip. Just try to have fun. You want your child to learn something and appreciate history but the main goal should be to have fun - the best way to ensure a love of history. Kids aren't easily impressed these days, so don't get too frustrated if you don't get immediate exclamations of joy - especially for the pre-teens. My niece went on a historic house tour with us one year and she gave mostly one-word replies and didn't really seem to get much out of it. She really surprised us when she asked the following year if she could go again! So what are you waiting for? Check out The History Girl's articles page for locations around New Jersey to visit with your family. Sandra K. Lee is a freelance writer, blogger, and mom of two very active kids in Middlesex County. She is the founder of parenting website www.ParenthoodNJ.com and has written for NJ.com, the Yahoo Contributor Network, Patch.com, the New Jersey Children's Writers Guild, and the New Jersey Moms' Blog. BC – Before children, she was a reporter for The Home News Tribune and then volunteer coordinator for St. Hubert’s Animal Welfare Center. All good counsel. As a docent/guide at two National Parks, I'd also suggest having a conversation with the guides or museum staff before bringing a small child on a tour. Ask them if the tour is appropriate for young people your child's age, and take them at their word. They've likely conducted the tour dozens of times and thus have experience with kids at your child's maturity and interest level. Due to logistics and staffing limitations, guides often can't permit a parent to leave the tour early with a bored child or let part of the group hang back in another room while the rest of the tour continues. Unfortunately, as trustworthy as most people are, site management can't take the risk that an unaccompanied visitor won't wander into restricted (or dangerous) areas, or inadvertently damage artifacts. Very good points and thank you for mentioning them. That's especially good advice if people are considering a visit to a location that's far away.